Vladimir Putin has been welcomed to Expo Milan 2015 by Italian president prime minister Matteo Renzi. He is the latest in a long line of international leaders to attend the event, with the Russian president in Milan for Russia’s national day celebrations. 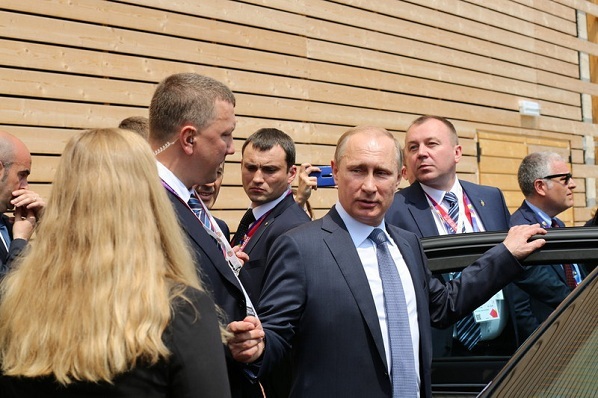 While at Expo 2015 he toured the Russian pavilion, which is focused on the sustainable food industry. “Russia and Italy are linked by a very close relationship that has lasted for over five hundred years,” Putin told crowds at the event. “Your country is one of our most important trading partners in Europe, a strong investor. The Russian leader was joined by a large delegation a flag-raising ceremony. Among others in the audience was foreign minister Sergei Lavrov, Rosneft president Igor Sechin, and the chief executive of Gazprom, Alexei Miller. Putin is also expected to visit the Pope while in Italy. Matteo Renzi added: “We thank Russia for their contribution to the successful preparation of Expo Milano 2015.